The Wilson Law Firm represents people in injury and accident cases involving the negligence of another person or business. The firm’s goal in every case is to protect the client’s interests and rights to the fullest extent possible. In many cases, people who fail to seek legal advice from a lawyer after they’ve been injured, later discover that they’ve made critical mistakes in their case. If you have been injured due to a negligent act, you should speak with an experienced Orlando accident attorney. Learn about your legal rights and options today. The Wilson Law Firm understands the legal issues in accident cases and can assist you in your case. In many cases, proper legal representation can help you reach a desired resolution without the need for a trial. However, some cases will not resolve and will need to go to trial. When this happens, you will want an experienced trial attorney to present your side of the case to the jury in a persuasive and effective manner. This will help you achieve the best results possible. If you or a loved one has been injured in an accident, call the Wilson Law Firm Today at (407) 648-5255 to speak with an Orlando accident attorney to learn more about your legal rights and options. Once retained, the Firm will investigate your case to determine what happened and which parties are potentially liable. We will then aggressively pursue compensation for any damages you or your loved one may have suffered. The law limits the amount of time you have to bring a personal injury action. You should speak with a Orlando accident attorney as soon as possible to know what the time limits are in your case. It also may take time to determine the total extent of any injuries. The parties may make a reasonable settlement offer within a few months. However, when there is a dispute as to fault or the extent of the injury, it may take some time before a resolution is reached. The Wilson Law Firm represents personal injury clients on a contingency fee basis. This means the Firm doesn’t collect any attorney fees until it recovers compensation for your case. Call the Wilson Law Firm Today to speak with an Orlando accident attorney about your situation or to schedule a Free Initial Consultation. The Wilson Law Firm represents individuals in accident and injury cases in the Central Florida area. This includes Brevard County, Lake County, Orange County, Osceola County, Seminole County, and Volusia County, Florida. 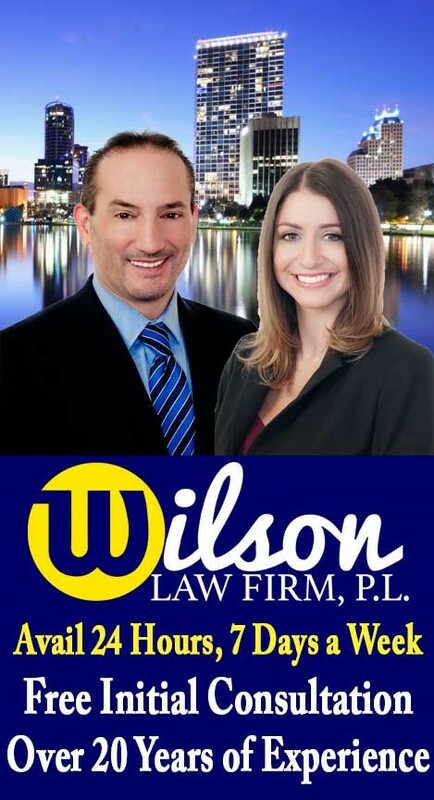 The Wilson Law Firm provides a free initial consultation where you will speak with an Orlando accident attorney and Orange County Florida injury lawyer to discuss your case. Call us today to speak with an experienced Orlando accident attorney about the legal process, your rights, and the cost for our services should you decide to retain the firm.